Standing room only, three degrees below zero outside, puffy down coats hanging from almost every available chair. Wine and cookies. And authors! 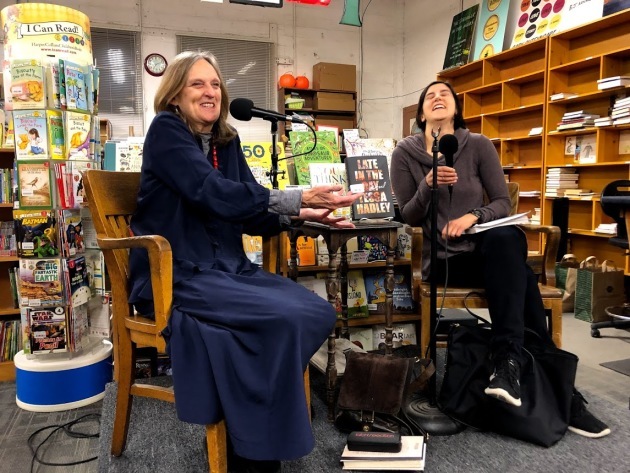 Magers & Quinn Bookstore in Minneapolis was a warm and welcoming place last night for writers Tessa Hadley (on tour for her latest novel, “Late in the Day”) and Curtis Sittenfeld (newly transplanted to Minnesota, whose latest story collection, “You Think It, I’ll Say It," will be out in paperback March 5). Pairing Sittenfeld with the touring Hadley was a stroke of luck and inspiration. In 2017, Sittenfeld had read and discussed Hadley’s short story “The Surrogate” for a New Yorker podcast. At that time, she and Hadley had not yet met. 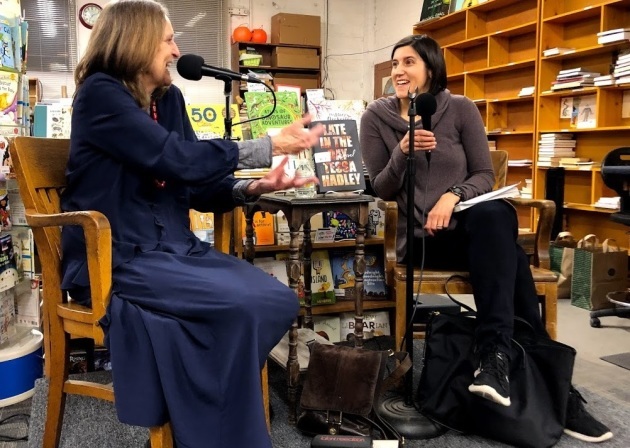 The New Yorker invited Sittenfeld to choose any story from their archives, Sittenfeld told the crowd at Magers & Quinn, and Hadley's was the one she picked. "Late in the Day," Hadley said, "is about two marriages--long marriages. If people stay together these days, marriages can last an extraordinary amount of time. Decades of hanging onto one person as they change. And I thought, what is the biggest, most monstrous change I could inflict on these two couples?" The answer: death. So Hadley killed off what she said was the most likeable character by about page four, and the book flows from there, moving back and forth in time smoothly. Hadley is known equally well for her stories and her novels, and Sittenfeld wondered how, when she started a piece, she knew which it would be. "I just do," Hadley said. "It seems that a short story just comes to you. It comes sweetly." On the flight to Minneapolis from Seattle "I got the whole of two characters. They just came to me." She needs a little more to make a story, but she already knows they won't become a novel. A novel, she said, requires more work. Digging. Though her subjects are often dark, she's well aware that "reading novels is for pleasure," she said. "Pleasure can come from sad things, but in the end your role is to entertain and beguile." She spoke emphatically about crafting the story of these two entertwined couples, and about the main character who has "this catastrophe smashing across her life." She gestured with her arm, a fierce chopping motion, and then stopped and said, "This is sounding less and less like an enjoyable read! But enjoyment comes in all forms." But writing good stories was so hard for her that she eventually went back to school, taking a writing course (similar to an American MFA program). It was, she said, a watershed. Instead of writing alone in her garret, "Suddenly I was writing for five people on Thursday." It made a difference, having an audience. And it got her competitive juices flowing as well. If another writer in her group did well, then Hadley was inspired to do even better the next week. "And I did," she said. "I learned authority. Make this better. Make something happen. Twist it around at the end. I had been writing my novels as though I were reading them--I wonder what's going to happen next. And that's no good, is it? You have to decide. You are in charge." Sittenfeld wondered if people sometimes worried that Hadley was taking notes on them, to put in her books. Did she do that? Hadley leaned back in her chair and laughed. Of course not, she said. "I'd have no friends!" That said, she might observe someone who had a particular quirk and file the observation away in her head without even realizing it. "And ten years later, you'll be fishing around and out of the depths you'll dredge up this thing that you didn't know you remembered and it's exactly what you need for a certain character," she said. "We're like magpies, really, aren't we?" Bookstores have lately been moving away from straight readings (Hadley did read from her novel, but only briefly) and into the realm of discussion. Pairing a notable writer with another notable writer -- as with Hadley and Sittenfeld -- elevates the quality of discussion. Last night was flat-out fascinating. The discussion was part of what Rain Taxi Review editor Eric Lorberer referred to as Rain Taxi’s “vagabond series” of writer events, which pop up all over the Twin Cities all year. And on a cold, cold Minnesota night, “being surrounded by books is as cozy as it gets,” he said. Huddled in down, munching cookies, sipping wine, listening to two brilliant minds--certainly everyone in the bookstore agreed.